A blog about G-d, Torah, the Jewish people and our relationship with one another. 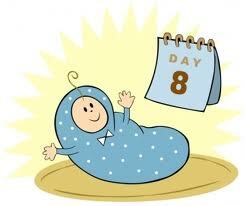 “On the eighth day you shall circumcise the foreskin of his flesh”. It’s a discussion between Rabbi Akiva and the Roman Governor Turnus Rufus- not a friend of the Jews; he was the one who ended up ploughing up the land upon which the Temple was built. Turnus Rufus asked Rabbi Akiva, "Whose deeds are better? Those of G-d or those of man?" Rabbi Akiva answered, "Those of humans are better." Turnus Rufus asked, "Behold the heaven and the earth. Can you make anything more beautiful than them?" He answered, "Do not tell me about something that is higher than human capabilities, since humans are unable to do these things, but let us compare things which humans are capable of." Turnus Rufus asked, "Why do you circumcise yourselves?" Rabbi Akiva answered, "I knew that you were asking about something like that, and for that reason I told you at the start that men's deeds are greater than those of G-d."
Rabbi Akiva then brought to Turnus Rufus two items: stalks of wheat and baked rolls. Rabbi Akiva said, "These the stalks of wheat are the deeds of G-d, and these the baked rolls are the deeds of humans. Are these baked rolls not more beautiful?" "If so," answered Turnus Rufus, "since G-d is interested in circumcision, why did he not create human beings already circumcised?" Rabbi Akiva answered, "Because G-d gave the mitzvot to the Jewish people only to purify them. And this is what David Hamelech said, "The word of G-d is pure, it is a shield for all those who take shelter in Him." Let me just delve into this Medrash a second. Turnus Rufus is trying to understand the need for a Jew to do a Mitzvah. If G-d created this world perfect; then why does man need to do anything with it? Indeed as a Jew I declare from His holy Torah that - The Rock (G-d) His work is perfect. (Haazinu) If I believe that G-d’s work is perfect how can the puny insignificant little me come along and say that I need to do anything to change his world to make it better? Of course Rabbi Akiva doesn’t believe that this world- the works of Hashem are anything less than perfect- but what Rabbi Akiva is saying is; that G-d wrote into the DNA of creation the need for man to take His creation and develop it; to become a partner, so to speak in creation itself. “And G-d blessed the seventh day and He sanctified it; because on it He rested from all His work which G-d had created Laasot; to make – to do. Rav Shimshon says that the la-asot is a command to man. G-d gives us the raw materials. We have the responsibility to take His creation and develop and improve it, and by so doing we become partners in creation itself. “G-d created man in His likeness- in the image of G-d He created him” One explanation of being made in the image of G-d is that man, like G-d, has the capability of being a creative being. Man can take G-d’s beautiful world and preserve and elevate it and make it a dwelling place for His Divine Presence. Man has the capability of reaching up to the height of the angels. Conversely- he also has the capability of dragging himself lower than the animal kingdom. The Talmud says: there are three partners in the creation of a human being ; father, mother and the Holy one blessed Be He. Hashem wants us to take His world and become partners with Him in creation. Our mission is therefore not to divorce ourselves from this world but to be actively involved in this world and elevating the world around us. This past Thursday we celebrated the 64th anniversary of the creation of Israel. Think back to the birth of our wonderful homeland- the pioneers who built up the land. The many- I believe twenty two thousand who gave their lives fighting for the land since its inception. May their memory be for a blessing. I think of how at the very outset, there were Arab nations surrounding Israel that wanted to destroy us and how some still do. Yet-despite all this- we were able to develop that land with only the 600000 people who were there at that time. Israel today has become the wonderful successful place it is. It is the only place for over two thousand years that the Jews have felt comfortable enough to call our home. And yet we have travelled so far. Hodu Lashem Ki Tov- ki leolam chasdo we give thanks to Him for He is good- His kindness is forever. Something I have mentioned a few times before as a Congregational Rabbi; Judaism is not monolithic, by that, I mean that everybody thinks uniformly, in the same way. Completely the opposite, within Orthodoxy there are usually a multiplicity of views on any given subject. You just have to read any text from the Talmud to know that its study is full of a diversity of opinions, from one extreme to another. I think this is essentially good and healthy because it means that Judaism is a rich vibrant tapestry of life. I say this to preface my words, because in reality being a religious Jew is not what some people might think, that a religious Jew is some type of automaton and just does without understanding the why and the wherefore behind what we do; but being a religious Jew means that I question and I analyse my life and what I am doing. It means I question the holocaust and try to find meaning out of a difficult theological conundrum. This Thursday we are celebrating the 64th anniversary of the State of Israel. And I think it only correct to examine what does Israel mean to me as a thinking Jew. By that- I do not mean whether or not it is a great place to take a vacation or do some business. It doesn’t say that Avraham passed through the land but in the land, even though he was only passing through, he passed in it. Rabbi Zev Leff explains: You disembark from the plane in Israel- you get into your Hawaiian shorts and flag down a taxi to take you to a hotel in Tel Aviv and spend the next two weeks sunning yourself on the beach. Or, you get off the plane in Israel and get a taxi to Jerusalem or one of our holy cities and spend the time at the Western Wall, visiting some of the holy sites. That is the difference between “passing through the land” or “Passing in the land”- Taking in the land, its history its meaning- making the land permeate and affect you. A critique by a friend, who recently returned from Eilat, was the fact that in the hotel in which he stayed out of a possible 200 guests, most of whom were Jewish, only 4 people lit their Shabbat candles. So here you are in our Holy Land, but there are Jews who don’t feel it and are only moved in a secular way. I want to assess what religious meaning I see in Israel. The restoration of our judges like former times; The rebuilding of your Holy City Jerusalem and its Temple; The ingathering of the exiles dispersed throughout the world; The Bringing of The Mashiach Speedily in our days and “may Our eyes witness Your return to Zion in compassion”. All these themes are part of the ingrained psyche of the Jew. All of these aspects of redemption are dependant on one another. For example one could not expect the ingathering of the exiles if one did not have an Israel to which to return. And these themes pre 1948 may have been utopian dreams, but today they are part of our reality. The first reaction to Israel is that we cannot have a secular State until Mashiach comes. It is G-d alone who brings the redemption, and who are we to push our luck with Hashem? Following this view; the establishment of the State of Israel has been a setback to the coming of Mashiach. The main people who were engaged in the State’s Creation were secular irreligious or anti religious Jews. Indeed there is a Talmudic discussion in Ketubot 111 concerning the three oaths that G-d adjured with Israel as they went into exile, one of which was that Israel should not go back to their land with force before Mashiach comes. The Talmud says in the name of Rabbi Yochanan Ben Zakkai that if people come to you in the town and tell you that Mashiach is here and you are in the middle of planting a tree, first plant your tree, then go to greet him. The rationale is that first we’ve got to do what we’ve got to do, then after that Mashiach will come, but not before and you definitely cannot push the coming before its time. You can take this view to its logical conclusion: Israel is an obstacle to redemption by the fact that it is a secular state, therefore Israel is wrong. Since the Jews are not supposed to be in Israel anyway before Mashiach comes, therefore we should side with the Arabs against Israel and go back to the pre Zionist days. That is the extreme view of Neturei Karta. But most Chareidi Jews do not go down that road. Israel exists, therefore we have to work with it and come to an accommodation with it, even though it is a Zionist secular state. The problems with this position are the following: How can you ignore what happened in 1948 and 1967 indeed throughout all the wars in Israel? How can you turn your back on this and say that there is not a Divine element here? How can you not see the Hand of Hashem in the mere fact that Israel exists? And also: How can you not see the good of Israel in the fact that there are more people today in Israel learning and practising Torah in the land than at any other time in our history? The second reaction toward Israel is the complete opposite: The view of Rav Kook and his followers: Israel is the fulfilment of the Messianic dream. For thousands of years we have been waiting for this moment of redemption and now it has come, and therefore it is Reishit tzemichat Geulateinu- the beginning of the flowering of our redemption and itchalta digeula- the beginning of the redemption. This is it and we slowly all have to realise that we have been redeemed. In the words of the Talmud: redemption is like the morning dawn; the light of the sun comes up unhurriedly, so too salvation goes through a slow process of redemption, bit by bit. “This is my mashiach!” She actually saw redemption in the land. But there are problems with this stance as well: Look at Israel and its problems. Look at the fact that we had the disengagement from Gaza a few years ago, a physical setback to redemption. Look also at the tensions between the Ashkenazim and the Sephardim, the Charedim and the Chilonim, the Jews and the Arabs- hardly a Messianic utopian dream. Israel has its problems therefore it cannot be the final fulfilment of the Messianic dream. The third reaction toward Israel is I believe the middle ground between the two, and it is the view that really holds water. You cannot deny that Israel is the greatest thing that has happened to the Jewish people since the destruction of the Temple 1930 years ago. You cannot refute that. Jews are able to live in freedom in their own land. In the words of the Hatikvah: Liheyot am chofshi beartzeinu- To be a free people in our land. But with that freedom comes responsibility; the Jews left Egypt, gained freedom, but fifty days later received the Torah at Sinai. lihyot am chofshi- to be a free people means: the freedom to live our lives as Jews ought to live their lives beartzienu- in our land. But this is not Mashiach yet. This is not true redemption. Israel has too many problems from within and without. We still need to work a little bit more on ourselves to bring Mashiach. We have to find unity, respect and love among the Jewish people. After the holocaust there was a tremendous silence. We cried out to Him- but we heard nothing. Who am I? I am Rabbi of Kenton United Synagogue, a suburb in London. For those not in the know; The US is the mainstream Jewish Orthodox Synagogal group in the UK under the aegis of the Chief Rabbi. My community is comprised of Jewish people of all shades of opinion from left, right and centre. However the community is Orthodox and is run on Halachic grounds only. My upbringing is as follows: I was educated in Ilford Jewish Primary, then Ilford County High. After that I attended Yeshivot in England, Israel, America and Montreal, where I received Semicha from Rabbi Hirschprung. I have been a Community Rabbi for over twenty years. Previous communities have been Newcastle and Staines. Copyright Yehudah Black. Watermark theme. Powered by Blogger.